Cloudy this morning with showers during the afternoon. High 54F. Winds NNW at 10 to 20 mph. Chance of rain 40%.. Mainly clear skies. Low near 35F. Winds NNW at 10 to 20 mph. 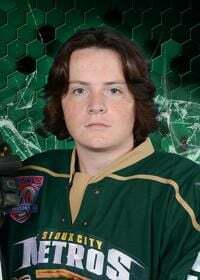 SIOUX CITY | Reece McDonald scored four goals Saturday afternoon while leading the Sioux City Metros to a 7-0 Midwest High School Hockey League triumph over the Mason City Mohawks at the IBP Ice Center. Hiking his scoring streak to seven games, McDonald’s afternoon was akin to the offensive success Coach Jesse Monell’s Metros record. Third in the MHSHL with 32 points and a 15-2-2 record, Sioux City threw up a season-best 62 shots while winning for the fourth time in its last five games. McDonald, who has nine goals and 15 assists on the season, stretched Sioux City’s lead to 2-0 with a goal at the 3:57 mark of the second period, a goal assisted by both Easton Ransford and Cale Bricker. Ransford assisted on two of McDonald’s three third-period goals. Ransford also assisted with Max Beller’s goal on the goal that gave Sioux City a 4-0 lead, 4:31 into the third period. Ransford has six goals and nine assists for the Metros. Bricker, who assisted on the second on McDonald’s third period goals, also has six goals and nine assists. Taylor Frerichs, Sioux City’s leader with 32 points (13 goals, 19 assists) had two goals and an assist. Ransford and Bricker had three and two assists, respectively. Chase Mann scored a second-period goal. Winning goaltender Blake Beller (15-2-2) posted his third shutout of the season. Beller stopped each of the 17 shots he faced. Dayson Tucker collected two goals and two assists while leading Sioux City’s junior varsity to a 5-1 victory. Tucker scored goals in the second and third periods for Sioux City, which improved its season record to 8-10-1. Parker Ohm contributed a goal and three assists while multiple-point performances also came from Cade Hesse (1 goal, 2 assists) and Mann (1, 1). Winning goalie Collin Patrick converted 16 of 17 save attempts. The same two teams will play Sunday at the IBP. The varsity game will begin at 10 a.m. and the JV contest will follow at noon. SIOUX CITY -- Every season Sioux City Metros hockey coach Jesse Monell needs some players to step into captaincy roles.